I found this dog happily sitting in the waiting room of a practice I see referral ophthalmology for, ready to have its yearly boosters. Curious, I asked its history. The dog had a cat claw injury followed by uveitis then glaucoma. Now it has settled down looking like this. What are we seeing here and are there any problems associated with this condition? 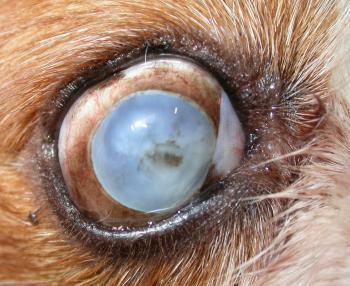 This dog has phthysis bulbi, where uncontrolled intraocular pathology has resulted in ciliary body degeneration and a reduction in aqueous production. Intraocular pressure was 5mmHg. The globe shrinks but without the pain and exposure associated with chronic glaucoma. The eye is blind, which I guess is quite a problem (!) but other than that the globe is quiet with the only possible problem being chronic infection in the ventral conjunctival sac which is bigger, the eye having shrunk in size. 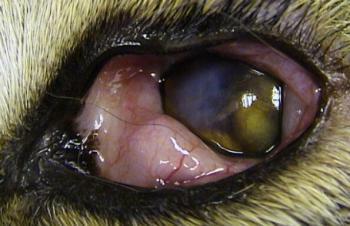 This picture shows a cat eye in the process of phthysis – once the process has started, I’m not aware of any way of halting it, apart possibly from trying to stop in inciting pathology in the first place. This entry was posted in Cases and tagged dog, phthysis bulbi. Bookmark the permalink.